‘Look’ or ‘focus’ is the foundation command for all other commands. If you can get your dog to look at you, then you can get him to pay attention to what you have to tell him next. 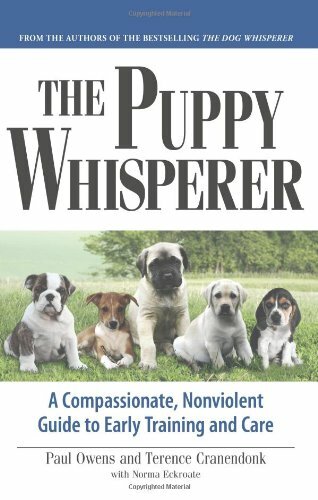 This is touched on in several pet training books and manuals including “The Puppy Whisperer”. “The Puppy Whisperer” calls it ‘pay attention’. Before you teach the command ‘look’ or ‘focus’ find a special treat which your dog loves. Make sure the treat is relatively healthy and can be broken down into small pieces. Next, make sure to do training before meal times so that he is hungry for the treats. And make sure he has just had a walk so that he is not overly energetic. Hold the treat in your hand and get your dog’s attention by saying his name. Just as your dog looks at the treat say ‘look’. Then give him the treat and tell him he is a good dog in a lavish voice. Training sessions should only last 5 minutes or so. Do 2-3 sessions of 5 minutes each daily. After a few days, you may notice that your dog looks automatically at the treat and you barely have time to say the command. At this point in training, say your dog’s name and the ‘look’ command right away. As soon as your dog looks at the treat, give him the treat and tell him he is a good dog. If your dog doesn’t look, say ‘eh eh’ and take the treat out of his sight. After a few days or so into training where your dog consistently looks at the treat in your hand when you say ‘look’, hold the treat for longer before giving it to him and praising him. Hold for 3 second and slowly work your way to 10 seconds as training progresses and your dog succeeds. When your dog is successful at reaching the 10 second hold it is time to move to the next step. Say ‘look’, hold for two seconds and slowly move the treat towards your face and to your eyes. When your dog looks in your eyes say ‘look’ again. Then give him the treat, tell him he is a good dog, and praise lavishly. After only a few successful sessions, stop saying ‘look’ the first time and only say it once when he looks you in the eyes. Eventually, you are going to want to say ‘look’ without a treat in your hand. Keep treats handy. And when you give the command and he looks at you, give him the treat. When your dog consistently becomes successful at looking in your eyes when you say ‘look’, slowly wean him off the treats. You will still want to tell him he is a good dog and give him praise. Some dogs may pick up the ‘look’ command right away while others may take longer. Don’t get discouraged. Every dog is different and learns differently. The ‘look’ or ‘focus’ command will be used throughout your dog’s life. Begin each training session with the ‘look’ command so that you know you have his full attention. Check out “The Puppy Whisperer” for more great tips on raising a dog. This entry was posted on June 20, 2011 at 7:05 am and is filed under Dog Books, Dog Training Tips. You can follow any responses to this entry through the RSS 2.0 feed. You can leave a response, or trackback from your own site.